Added on November 28, 2011 by Jourdan. I just watched the PBS documentary on South African artist, William Kentridge, called Anything is Possible. I know I've seen it before, but I can't remember for the life of me when/where. If ever I teach a drawing class of my own, I will definitely show this film to my students. He pushes "drawing" like no artist I've seen. William Kentridge's work is quite amazing, involving so many factors yet flowing so smoothly. I particularly enjoy watching footage from the opera he staged and directed called The Nose. Added on November 15, 2011 by Jourdan. ... An intelligent and quietly hilarious film, (Untitled), delivers a fresh take on the contemporary art world and cleverly satirizes its various stereotypical players. There's Madeleine, the NY gallerist, who is committed to showing work that is odd and unsellable, such as Adrian's serious experimental music/sound art, but is forced to sell Adrian's brother's uninteresting commercial paintings to keep the doors open. Added on November 8, 2011 by Jourdan. I finally watched this film... and I highly recommend it! 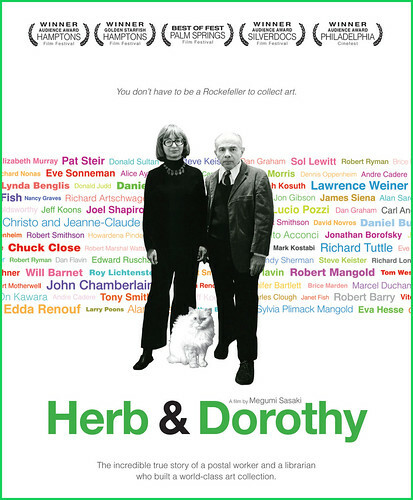 "HERB & DOROTHY tells the extraordinary story of Herbert Vogel, a postal clerk, and Dorothy Vogel, a librarian, who managed to build one of the most important contemporary art collections in history with very modest means. In the early 1960s, when very little attention was paid to Minimalist and Conceptual Art, Herb and Dorothy Vogel quietly began purchasing the works of unknown artists. Devoting all of Herb's salary to purchase art they liked, and living on Dorothy's paycheck alone, they continued collecting artworks guided by two rules: the piece had to be affordable, and it had to be small enough to fit in their one-bedroom Manhattan apartment. Within these limitations, they proved themselves curatorial visionaries; most of those they supported and befriended went on to become world-renowned artists including Sol LeWitt, Christo and Jeanne-Claude, Richard Tuttle, Chuck Close, Robert Mangold, Sylvia Plimack Mangold, Lynda Benglis, Pat Steir, Robert Barry, Lucio Pozzi, and Lawrence Weiner. "